Are you training for a competition or certain event? Do you train every day? Are you allowing your body enough recovery time? If you are training hard and not giving your body enough time to recover, you may be at risk of developing over-training syndrome. 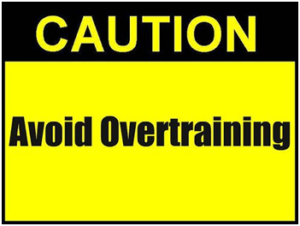 Do you have a few of these with regards to training? You may be on your way to having over-training syndrome or already there. Here are a few things you can do to fix it! Rest and recover. Stop training for a few days and allow your body time to heal and rebuild. Hydrate. Drink tons of water which can help flush out any toxins in your tissues. The recommended amount per day is 1oz for every pound of body weight. Cross train. Do other forms of exercise that can help build cardiovascular function or muscle mass. Instead of lifting weights heavily, try resistance exercises or get outside and go cross-country skiing. Sports massage. Find a great massage therapist that is trained in sport specific massage to help with recovery. Chiropractic care. Spinal adjustments help restore proper function to the nervous system which controls everything in your body. When your nervous system is not functioning optimally, neither are your muscles or joints. Getting consistent chiropractic care can keep you healthy.